We always offer to you professional items with our professional attitudes. Our Professional Walkie Talkie here refers to those Walkie Talkies that their transmit power is 4-5w, their power ranges are 136-174MHz or 400-480MHz. 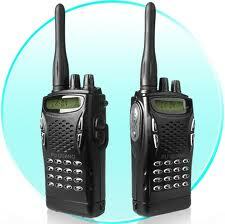 Also this Walkie Talkie is usually at a more far communicating distance of 3-8km (changes as the different environment). They feature an easy operation since most professional Walkie Talkies don't come with digital keyboards but only with two knobs to control number of channels, power source and switch. The deficiencies of professional Walkie Talkies is much bigger in size and weight, but much superior in waterproof, anti-shock, anti-fall and anti-aging aspects, and the performances are more stable. Usually, they are widely used in constructional engineering, property management, factories.